Growing demand and a shortage of radiologists have increased the need for teleradiology. No doubt, teleradiology is here to stay. But it's not the teleradiology that started in the mid-1990s when high-speed communications networks sprung up across the country, making it possible for radiologists to read digital exams anywhere they had a workstation. "Teleradiology grew rapidly in its first 10 years or so," says Shannon Werb, president and chief operating officer of vRad, a MEDNAX, Inc, company and a radiology practice and teleradiology company. Early on, teleradiology was largely a solution to the need for interpretation of emergent after-hours studies. "Radiology practices would contract with companies like ours, and we would provide overnight preliminary interpretation such that the daytime practice didn't have to staff the overnight hours," Werb says. These days, teleradiology is no longer a preliminary service only. Rather, it is an essential part of radiology reading services across the country and throughout the world. Teleradiology has moved from providing preliminary reads off hours to providing subspecialized final reports day and night. "When I started with vRad in 2013, 75% of the volume was preliminary services," Werb says. "Today, we're running about 60% final and 40% preliminary." That shift is representative of the market maturing, which is enabling direct integration of a complete clinical history and results, along with payer enrollment, he says. Teleradiology also provides the specialty radiology coverage that is increasingly in demand but that health care systems can't afford to provide on their own. "Our field has changed, and the trend is for subspecialists to read subspecialty exams," says Philip A. Templeton, MD, FACR, CMO and founder of DocPanel.com, which provides on-demand specialty coverage. "It's very difficult today to be a general radiologist and also be good at neuroradiology, musculoskeletal radiology, abdominal imaging, pediatric imaging, etc." With consolidation in health care and the need to keep costs down, radiology groups and hospitals can't afford to have subspecialists on staff 24/7 to read exams that require their skills—and it is impossible for small imaging centers to do so. So, they contract with companies like DocPanel that can provide subspecialists who can read specialty exams on demand. DocPanel doesn't require contracts. It will provide radiology services for one exam one time or for multiple exams over time. Its clients can build their own panel of specialists. "It's like a fantasy football team or Match.com," Templeton says. "You can say, 'I like these two neuroradiologists and this pediatric radiologist' and use them for your reads." DocPanel also provides radiology services for patients who want a second opinion. Templeton says that's an emerging category of requests that his firm is very focused on. "We frequently do get requests from patients and families who want a second opinion on imaging exams they've already had," he says. Teleradiology also allows patients in nearly any part of the world to get expertise that was once available only to patients in urban areas, says Sham Sokka, Philips' head of radiology solutions. Teleradiology is allowing projects like SHINEFLY, a teleradiology application and services platform cocreated by Philips and Digital Health China, to meet the demands of China's rapidly expanding health care system. Launched in April, SHINEFLY is a cloud-based teleradiology service that will allow radiological images and associated patient information to be remotely viewed, analyzed, and reported on by clinical experts anywhere in China. The hope is that patients will be able to receive optimum treatment via their local hospital, wherever they are, Sokka says. "There's enough money in China to purchase the necessary imaging equipment; they just don't have the physician infrastructure they need to make use of it throughout the country," he says. Philips is working with the Chinese government to identify pilot locations for this project and hopes to launch a few sites sometime early next year. Advances in technology may have been the primary driver of teleradiology in its early stages, but, once imaging became digital and broadband allowed technologists to easily upload the digital images they acquired to any PACS system in the world, teleradiology took off. It has also helped that EMRs and cloud sharing have made it easier for radiologists to retrieve prior studies and deliver complete clinical reports. For these reasons, it has become possible for teleradiologists to provide not only preliminary but also final reads, Werb says. What's driving teleradiology's adoption today is much more than technology, the experts agree. A big driver, Werb says, is consolidation in health care and the competition among those who remain. The average-size radiology practice in the United States is 10 to 15 physicians, he says. With that few, it's hard for the practice to have subspecialty capabilities 24 hours a day, seven days a week. "So we augment their practice, not just at night but also during the day," Werb says. "Maybe, they need half a neuroradiologist because they have grown volume for neuro exams at a specific site. It's hard to hire half a neuroradiologist, but we can easily supply what they need in a cost-effective, pay-per-study model. Likewise, as groups are coming together, growing in size, and expanding their services, it becomes increasingly important that they can access a differentiated/subspecialized teleradiology service, enabling that growth to continue." The growth of urgent care centers—standalone emergency departments, many of which have X-ray capabilities and even ultrasound—increases the demand for teleradiology, too, Sokka says. It's not feasible for an urgent care center that's open most days and until late to pay a radiologist to staff it full time, but it still needs to be able to provide fast interpretations of X-rays performed at the center. The easy solution is for the urgent care center to use a teleradiology service, whether that's with the hospital that is attached to its name or, if it's a standalone facility, with a teleradiology service. Not only is the field of radiology experiencing a shortage of generalists, thanks in part to retirements, it is also feeling a shortage of specialists, who are increasingly in demand, Templeton says. "If you look at the literature, whether it's musculoskeletal or neuroradiology or breast imaging or pediatrics, somewhere around 30% to 40% of cases report the diagnosis, staging, or treatment will be changed if a specialist reads the case vs a nonspecialist. That's substantiated over and over again," he says. At the same time, health systems are trying to establish centers of excellence, such as for foot and ankle orthopedic centers, and deliver excellent care. The centers need radiology specialists who can read and interpret these specialized exams. "Obviously, every practice can't have every one of every specialty in it, and small and rural hospitals can have the imaging equipment but not all the specialists they need to read their exams," Templeton says. "We provide this on DocPanel with university departments and fellowship-trained individuals. I think teleradiology or virtual radiology is the way we can deliver what they need to provide their patients with that excellent care." Recent radiology graduates also have different ideas about lifestyle than perhaps their teachers and mentors, Sokka says. "Not everyone wants to work 50 to 60 hours a week reading from his/her workstation at the hospital," he says. These recently trained radiologists are technically savvy and grew up with smartphones and AI. They want to be able to read at their home or their vacation getaway and from their smartphone or tablet. Senior radiologists who want to retire and move may still be willing to spend a few hours a day or week reading from their new location, if they can. 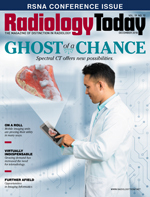 The demand for a more reasonable lifestyle is encouraging radiologists to read for teleradiology services and keep their hand in their field but not feel overwhelmed by the demands of their job, Sokka says. Expect to see even more growth in teleradiology over the next few decades. According to global market analysis conducted by Transparency Market Research on behalf of Philips, the global teleradiology services market was valued at $4.6 billion in 2017 and is estimated to reach $21.8 billion by 2026. The recent report, according to Philips, found that virtual radiology was ranked as the largest growing health care outsourcing sector, with 90% of providers considering outsourcing in 2019. Still, the experts agree, some things have to happen for it to continue on its current trajectory. One is incorporating AI to improve workflow and shorten the time required to read exams, Sokka says. "As a teleradiologist, if I do more volume, I need to be able to read in a shorter time with quality results. It helps to be able to automate little tasks in reading and if the most urgent cases are on the top of my worklist," he says. "Also, it helps, too, if what I need to know about the patient's prior history is easy to search. AI can help enable the teleradiology space and allow radiologists to do more volume in less time." Radiologists also need to get over the fear that teleradiology is going to take their work away, Templeton says. When teleradiology first started, he says, there was a mentality that teleradiology firms were going to mean the end of radiologist practices' contracts with hospitals and imaging facilities. That's just not true and never was, Templeton says. But some of the old fears remain. "The truth is that teleradiology services like ours partner with practices," Werb adds. "We're here to help the practice grow and thrive and provide better services to the health care system overall." Werb says predatory teleradiology firms were a hot topic five to 10 years ago, "and you hear a lot less about it now because the need to use teleradiology services has become much more prevalent, while the initial concerns just haven't taken shape." "We also provide educational support to practices, with our educational consults and RadProfessor service," Templeton says. "So practicing radiologists can learn from their challenging cases." Rob Cascella, CEO of Philips Diagnosis & Treatment, sees only continued growth as teleradiology enables providers to increase their volume while maintaining quality. Like his colleagues, Cascella says the field can expect to see teleradiology or virtual radiology driving world-class academic medical centers to move into "brand name" radiology outsourcing and more contracting with primary care hospitals to have their physicians read complex images, not only in the United States but also abroad.